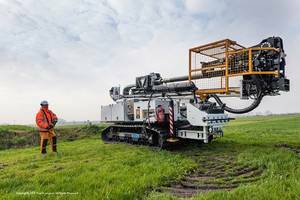 SALT LAKE CITY, Nov. 28, 2016 - Boart Longyear (www.BoartLongyear.com), the world's leading provider of drilling services, equipment and performance tooling, will showcase its leadership in sonic drilling technology during 2016 Groundwater Week in Las Vegas, NV, December 7 to 8. Boart Longyear has decades of experience in sonic drilling methods and related product development. Featured at Groundwater Week will be Boart Longyear's full line of sonic performance tooling, including bits, core barrels, rods, casing and more, as well as the LS™250 MiniSonic™, a compact sonic rig that provides an overall safer working environment. "As sonic drilling steadily gains acceptance as an alternative to auger drilling and other conventional techniques, the LS250 MiniSonic is quickly proving to be the ideal solution for a wide range of needs, including water, geotechnical, environmental and mining applications," said Mike Lawhead, Outside Sales Representative, of Boart Longyear. "Safety, speed and efficiency are among the many benefits." Sonic drilling involves the use of a dual line threaded drill pipe, with the inner line being advanced with a core barrel attached to it. Drilling fluid is not used during sampling, so this "dry" sampling results in intact core samples that are unaltered by drilling fluids. As a result, the LS250 MiniSonic provides a continuous, relatively undisturbed core sample of unparalleled quality through any type of formation. When using the iso-flow groundwater profiling system, hydrogeological and geochemical data can be easily obtained. Another benefit is the reduction of drill spoils and waste by up to 80 percent compared to conventional drilling methods. Safety features of the LS250 MiniSonic rig include an interlocked rotation barrier, reduced noise levels, a dump mast and wiggle tail, and a rod presenter. The interlocked rotation barrier automatically slows head rotation when the barrier is open. The rig also provides lower noise levels when equipped with the Tier 4i engine package. Boart Longyear's product experts will be on hand during Groundwater Week at Booth 757 to discuss the LS250 MiniSonic and complete line of sonic performance tooling. Visit Boart Longyear online for more information about its LS250 MiniSonic and sonic performance tooling. Boart Longyear is the world's leading provider of drilling services, drilling equipment and performance tooling for mining and drilling companies globally. It also has a substantial presence in aftermarket parts and service, energy, mine de-watering, oil sands exploration and production drilling. The Global Drilling Services division operates in over 30 countries for a diverse mining customer base spanning a wide range of commodities, including copper, gold, nickel, zinc, uranium, and other metals and minerals. The Global Products division designs, manufactures and sells drilling equipment, performance tooling, and aftermarket parts and services to customers in over 100 countries. Boart Longyear is headquartered in Salt Lake City, Utah, USA, and listed on the Australian Securities Exchange in Sydney, Australia. More information about Boart Longyear can be found at www.boartlongyear.com. To get Boart Longyear news direct, visit www.boartlongyear.com/feed.